In San Pablo, Mexico, an expedition prepares to look for two missing archeologists, Professors Scott and Farnsworth, who had been searching for the lost Aztec Temple of the Sun. The two men have now been missing for two months. Charlie Chan, who is on his way to Mexico City for a vacation with two of his sons, Number One Son, Lee and Number Two Son, Tommy plus chauffeur and "associate" Birmingham Brown, finds Professor Scott delirious as he collapses in a field near the road to San Pablo. Later, in San Pablo, Scott explains that after he and Farnsworth had found the temple, they were held as hostages and were forced to unearth a fortune in Aztec jade and gold. However, before Scott can name his captor, the lights go out and he is murdered with a knife. A search party is organized out to look for Farnsworth and the lost temple. The group includes Farnsworth's sister, Joan, who is also his heir; her fiancé, archeologist John Stanley; Farnsworth's fiancé, Sonia Cabot; and archeologist Professor Paul Evans. While Chan discusses the case with Captain Gonzales, a figure, spotted by Lee, attempts to shoot a poison dart through the window. Lee runs out to catch the man, an Aztec Indian, who flees into the night. The next day, Chan, his sons, and Birmingham join the expedition, which camps at the foot of the Diablo Mountains, not too far from San Pablo. The plan of the search party is to look for a stone containing hieroglyphics that Scott had said will lead them to the secret entrance to the lost temple where they will hopefully find Professor Farnsworth. While on night watch, Birmingham sees an Indian named Manuel leaving the camp, and Chan and Lee follow him. Meanwhile, Stanley sneaks out of the camp and goes to the temple where Farnsworth is being held hostage in order to unearth the tomb of an ancient Aztec king that contains a fortune in treasure. Stanley orders his henchman, Diego, to kill Chan. However, Diego, who is about to throw a knife at the detective, is shot dead by Pedro, the camp cook, who reveals to Chan that he is actually an agent of the Mexican secret service who has been following the detective. Chan removes Diego's wig, showing that he is not an Aztec Indian, but an American disguised in order to cast suspicion on the Indians. Stanley, meanwhile, threatens to kill Joan Farnsworth and Sonia Cabot if Professor Farnsworth does not cooperate in deciphering the hieroglyphics that will lead to the discovery of the Aztec king's tomb. After Sonia is killed in camp with Professor Evans' knife, two search parties go out. Chan's sons locate the rock containing the directions to the temple, but they cannot figure out how to enter it. When Birmingham inadvertently sits on a rock that triggers the mechanism that opens the door to the tomb, he is grabbed and pulled inside by Farnsworth's henchmen. Lee and Tommy soon discover that he has disappeared. Stanley, who had been leading one of the search groups, suddenly holds Joan and a Mexican guide named Jose at gunpoint and forces them to enter the temple, where Jose is shot by Manuel. Chan and his sons finally realize that the rock, which is marked by a symbol of a feathered serpent, is the temple's entrance, and they enter with Pedro. Once inside, they knock out Stanley, then Chan explains that Stanley had killed Sonia because she had been helping him to smuggle Aztec treasures out of Mexico and he wanted to silence her. Chan and his traveling companions now prepare to continue their journey to Mexico City. While the detective is amused to hear that the police there are in need of his help in another murder case, Birmingham Brown is not so happy with the news. NOTES: The opening title card of this film reads: Charlie Chan in The Feathered Serpent. This is the only film in which Charlie Chan's number one and number two sons actively work together with their father on a case. It is also the final appearance in a Charlie Chan film by Victor Sen Yung (Sen Yung). The plot of this film was based on that of the 1937 movie, The Riders of the Whistling Skull (which, interestingly, featured Robert Livingston who later appeared as John Stanley in the Charlie Chan version). Man who improve house before building solid foundation apt to run into very much trouble. Sometimes human tissue tell more than human lips. Very difficult to estimate depth of well by size of bucket. Guilty conscience always first to speak up. Hunch not sufficient evidence to convince jury of guilt. Sleep sometime very difficult thing. Innocence or guilt must be decided by proper parties. Confucius reminds us...that only children and fools open their mouths when they have nothing to say. Confucius say, "He who lives in fear, lives longest." LOCATIONS: San Pablo, Mexico. There are a number of towns and locations throughout Mexico named San Pablo, however a good possible candidate would be the village San Pablo located in Mexico's state of Guanajuato. San Pablo, Guanajuato is located about 250 miles northwest of Mexico City, the stated destination of Charlie Chan, and is near to the Sierra de Puruagua mountains, thus fairly matching the terrain seen in the film. 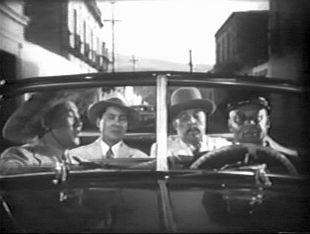 THE NAME OF THE SONG SUNG BY PEDRO FRANCISCO LOPEZ: "Ceilito Lindo"
THE NAME OF THE SONG SUNG BY TOMMY (JIMMY) CHAN: "La Cucaracha"
ACCORDING TO CHARLIE CHAN, THE LOCATION OF THE SPOT WHERE HE AND HIS PARTY FOUND PROFESSOR SCOTT: "About three miles north of here (San Pablo)." ACCORDING TO BIRMINGHAM BROWN, THE LENGTH OF TIME SINCE CHARLIE CHAN, LEE, TOMMY (JIMMY), AND HE HAD LEFT HOME ON THEIR TRIP TO MEXICO CITY: "...four days ago..."
THE CONTENTS OF THE TEMPLE ACCORDING TO PROFESSOR SCOTT: "Fortunes of jade and gold." THE LOCATION OF THE TEMPLE ACCORDING TO PROFESSOR SCOTT: "South of here (San Pablo) at the foot of the Diablo Mountains." ACCORDING TO CHARLIE CHAN, THE LENGTH OF TIME REQUIRED "UNDER (CALIFORNIA?) STATE LAWS" TO DECLARE A MISSING PERSON AS DEAD: "...heir must wait seven years before can collect money." ACCORDING TO CAPTAIN GONZALEZ, THE TYPE OF WEAPON USED IN AN ATTEMPT TO KILL CHARLIE CHAN: "The blow gun is definitely of Aztec design." ACCORDING TO PROFESSOR STANLEY, THE DISTANCE FROM THE CAMP TO THE AZTEC TEMPLE: "...a few miles." THE LOCATION IN NEW YORK CITY MENTIONED BY BIRMINGHAM BROWN AS BEING PREFERABLE TO HIS PRESENT WHEREABOUTS: "125th Street and 8th Avenue (in Harlem)"
THE "HEAVY" UNCLE MENTIONED BY BIRMINGHAM BROWN: "Uncle Fullback"
Aztec - Pertaining to the people of central Mexico whose civilization was at its height at the time of the Spanish conquest in the early 16th century. Joan Farnsworth: "He and Professor Scott came down here last spring to search for the ancient Aztec Temple of the Sun." bump off - (Slang) To murder. Lee Chan: "Say, Pop, isn't that the same guy that tried to bump you off the other night in San Pablo?" 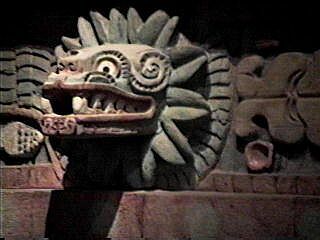 Kukutan (Kulkulcan) - (Aztec: Quetzalcoatl - "Feathered Snake") One of the major deities of the Aztec, Toltecs, and other Middle American peoples. Sign: "Posada Del San Pablo"
razzle-dazzle - (1) Dazzling excitement. (2) Elaborate action or maneuvers designed to deceive an opponent, as in a sports contest. (3) Extravagant or showy display, as of technique. Lee Chan: "Just how do you fit into this razzle-dazzle, anyway?" The feathered serpent appeared in the art of all Mesoamerican cultures, including the Aztec. Many meanings were probably attached to the feathered serpent, although it does not mean that serpents were worshipped. The temple on which it appears was named the Temple of Quetzalcoatl when these figures were first found in the early twentieth century. Quetzalcoatl is an Aztec word that means "feathered serpent." The word is also associated with the planet Venus, the wind, and to a mythological Toltec ruler. The Mayan word for the feathered serpent, Kukulcan (or Kukutan), was used in reference to a carved figure that was found in the Aztec Temple of the Sun in The Feathered Serpent.